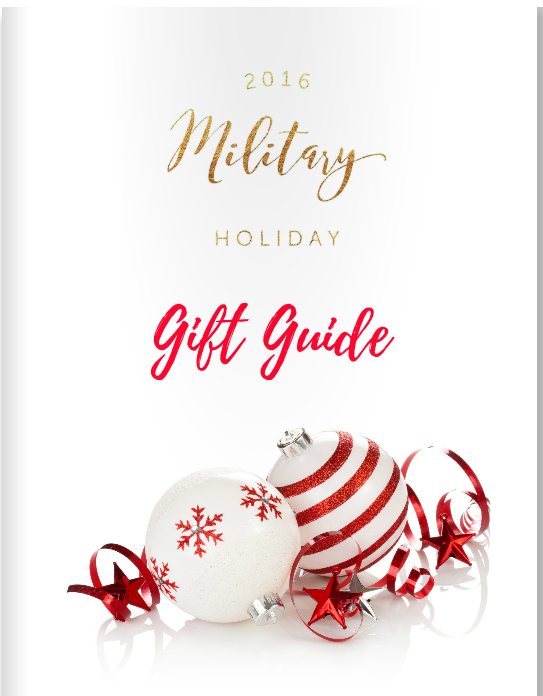 We launched our Military Gift Guide Series yesterday with “10 Food & Drink Gifts To Give With Military Promotions“. Today’s gift recommendations are for the male current/former service member in your life. 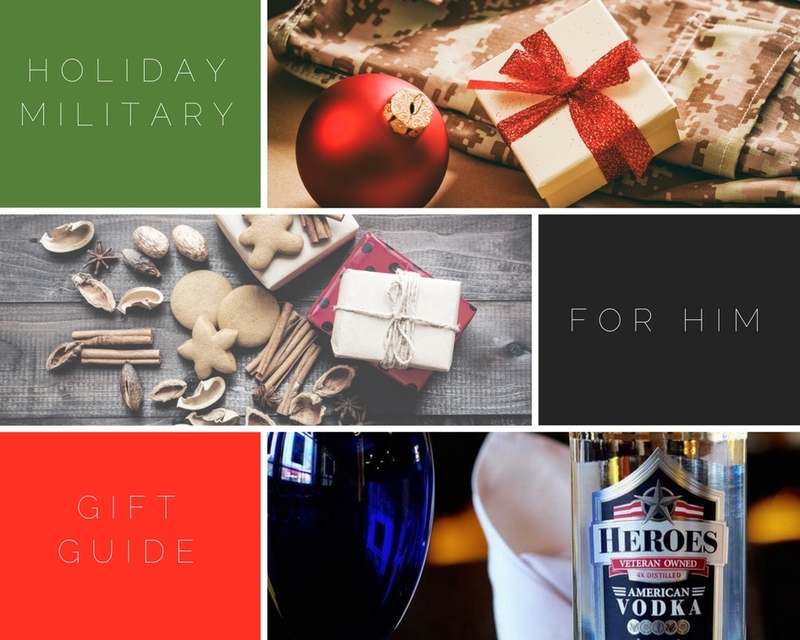 These gift suggestions once again come from brands Vet/Milspouse owned businesses as well as brands who offer Military discounts or support military organizations through charitable initiatives. Click the links below the pictures to see full product images. 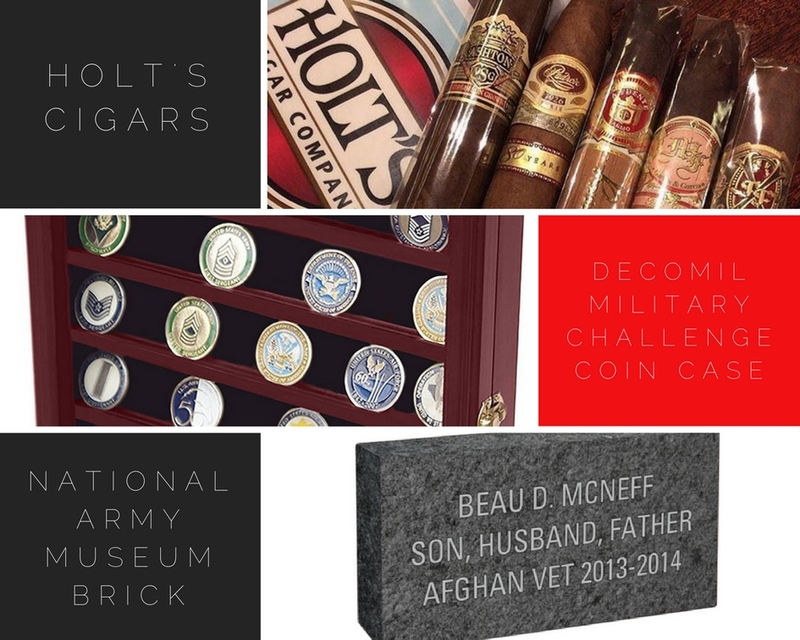 Holt’s Cigar Company- This military gift guide for him is sponsored by Holt’s Cigar Company. Not only do they offer a 10% military discount and ship to APOs, but also, their website breaks it down into convenient categories such as “Cigars for Beginners” and “Individual Cigars” etc. If the man in your life is not into cigars check out their Man Cave Essentials for other fun gifts like drink ware, flasks, poker sets and much more. Check out our full Holt’s Feature and see why military guys love cigars here. Decomil Military Challenge Coin Case- Soldiers receive coins all the time and they certainly hold a special value. Give the gift of memories and organization with this awesome wooden antique looking case. 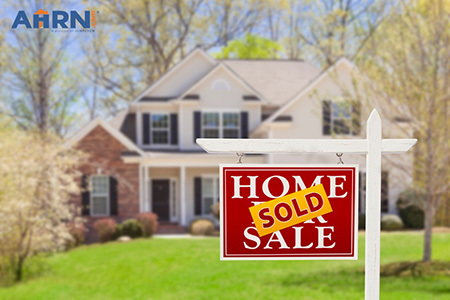 It’s durable, has great detailing with a real glass door. 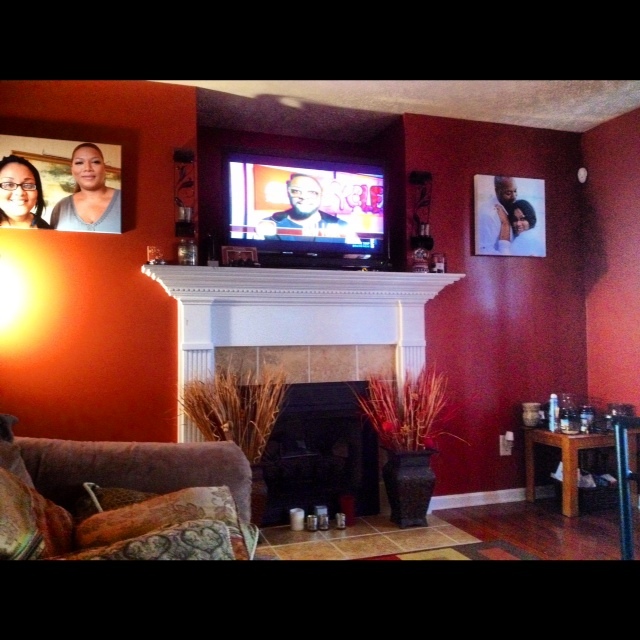 It’s also wall mountable. National Museum Of The US Army- Honor your spouse’s service this holiday season with a commemorative brick from the National Museum of the U.S. Army. These one-of-a-kind, personalized bricks will be inlaid on the grounds of the Museum to remember the sacrifice and service of our country’s Soldiers. Every individual who has worn the Army uniform deserves to be recognized, so don’t miss out on this exclusive opportunity. (Brick installation will begin this summer prior to the Museum’s 2019 opening). Debowa Military 50 Premium Vodka– The entertainer and Vodka lover will love this vodka in a bullet shaped oak bottle and a copper head. 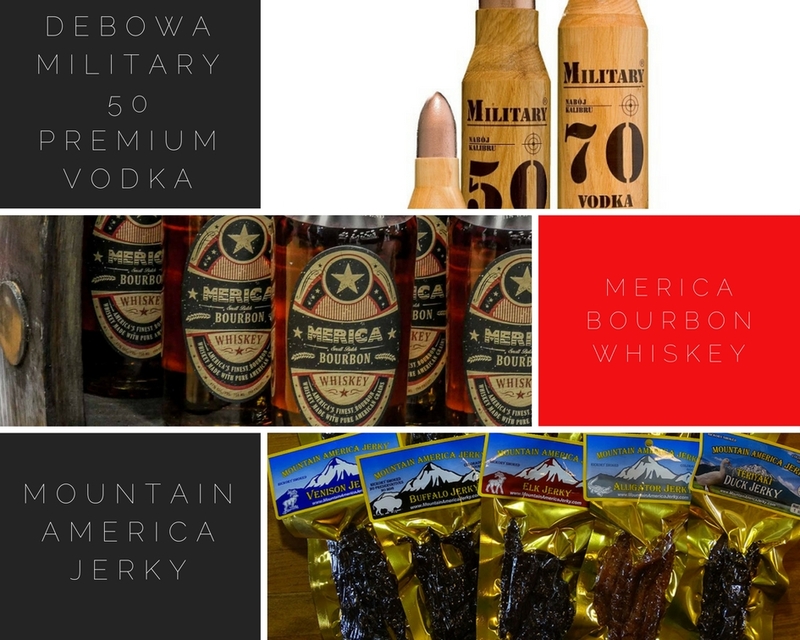 Mountain America Jerky- This company works closely with troops and sent over 600 pounds of Jerky to troops along with Adopt A Soldier this November. They sell a variety of premium quality jerky. Choose from Elk Jerky, Fish Jerky, Buffalo Jerky , Beef Jerky and many more. 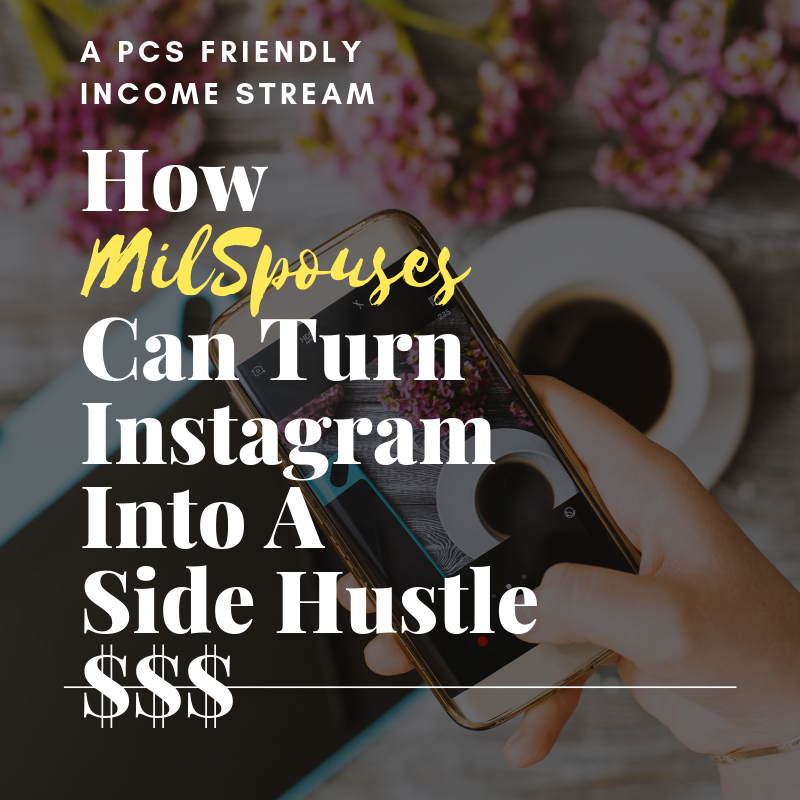 They also offer a monthly subscription option. They make and take special pride in shipping to APO locations. 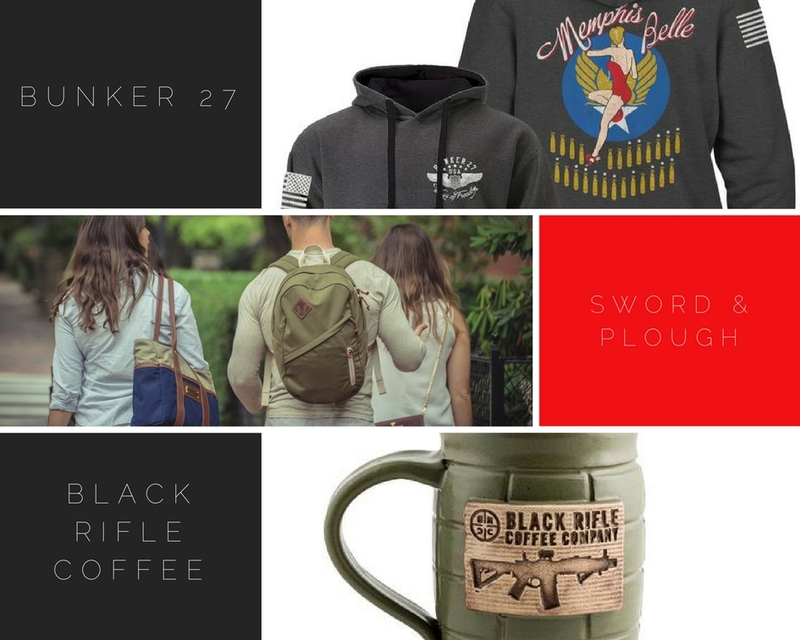 Bunker 27- “is a veteran owned military apparel brand, that creates finely crafted World War II and modern day aviation themed apparel and is officially licensed by the U.S. Air Force™. The company’s mission honors those who keep us free, past, present and future and commemorates military aviation.” They also offer a 15% military discount in addition to giving a portion of their yearly sales profits to Got Your 6 which is committed to helping transitioning veterans. Sword & Plough- I’ve been a fan of their’s since they started and am a proud owner of their Grey wool bag and weekend tote. This bag and accessory line was created by Emily Cavness the daughter of a Vet and soldier in the US Army herself. They use thousands of pounds of repurposed military surplus materials in their product line and manufacture exclusively in the United States. Their “Green Field Pack” is awesome for exploring those new duty stations and carrying all your day trip travel needs the cool way. All of their bags are high quality and come with a warranty. Black Rifle Coffee- Why not give the gift of a coffee club subscription from this Vet owned brand along with this custom handmade Grenade Hand Mug (pictured above). We also love their Christmas Gift Bundle that includes 2 batches of their fresh roasted coffee, a hoodie from their new line of lightweight pullover hoodies, and a an enamel mug. Black Rifle provides premium coffee in which they roast in small batches for quality, freshness and amazing taste. Lastly they employ vets….enough said! 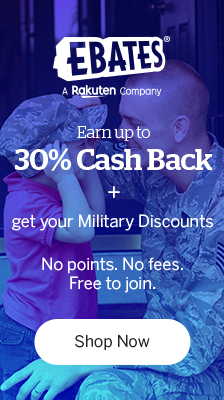 Day 3: Military Holiday Gift Guide…CanvasPop.com Canvas Prints Plus Giveaway! It’s Finally Here: The 2012 Army Wife 101 Military Holiday Gift Guide and Giveaways Starts TODAYYYY!